The holidays are just around the corner, and your classroom is probably becoming a hectic place. How would you like to simplify your writing instruction, while at the same time noticing your kids interest in writing growing? I am going to show you how I have done this the past few years and how much it has helped even my most reluctant writers soar. I live and work in a community where the main holiday celebration this time of year is Christmas. For many years I have had a classful of children who celebrate Christmas, and all they can think about is Santa and the holidays and all the magic that is a part of this time of the year. 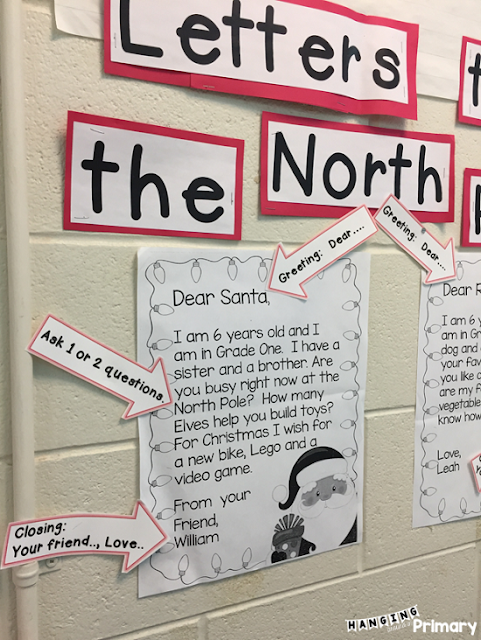 I really wanted to capitalize on that, so I created Letters to the North Pole. 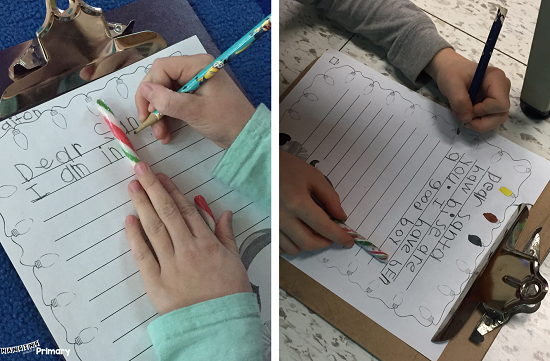 The best way to get kids to write is to give them real reasons to write! My students write to Santa every year and a class of Grade 8 students respond to their letters. Writing a letter to Santa is the most authentic writing task you can give a child this time of year, and that authenticity is the buy-in. Students write best when they have a real reason to write. All of the conventions we have been working away at (with varying levels of success) come to the forefront. 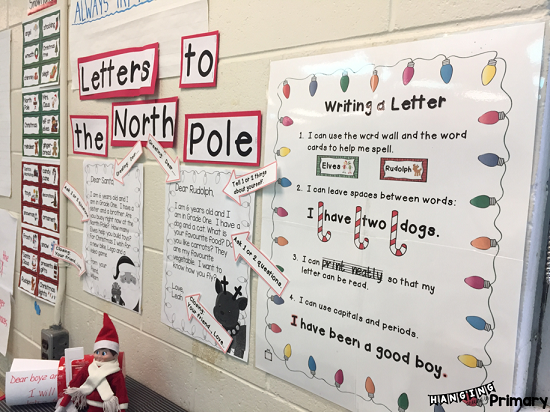 Now my students really understand why they need to have finger spaces and the importance of using the word wall, What if Santa can't read their letter?! They finally start to use conventions because they KNOW they need to! To start, I work through a lesson and introduce the Anchor chart with our success criteria for writing. We look at the samples and build an anchor chart showing the parts each letter should include. Providing this structure definitely helps students to be more successful. However, their all-time favourite part is using candy canes as their holiday "spacemen." 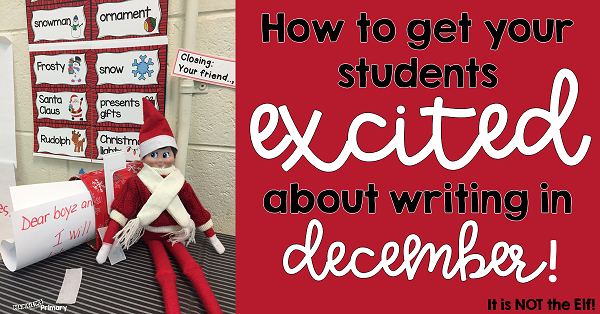 You might be wondering... How is this going to keep my kids writing all of December? Well, Santa isn't the only one who lives at the North Pole! There is Mrs. Claus, Rudolph, the other reindeer and the Elves. Once they realize they can write to everyone, you should see their eyes light up. The Writing Center is the place to be! I have specific writing paper for each of these people/animals. What do you do with all these letters? We have an Elf on the Shelf in our classroom. The students write letters to him too. He is also our delivery elf. 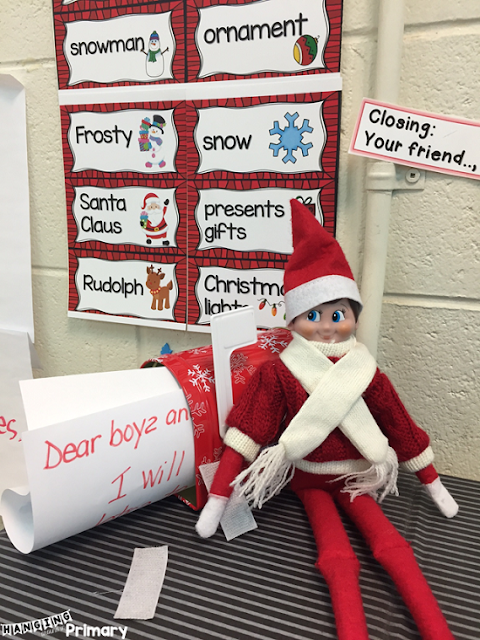 Each evening he checks the mailbox at the writing center and takes the letters to the North Pole. 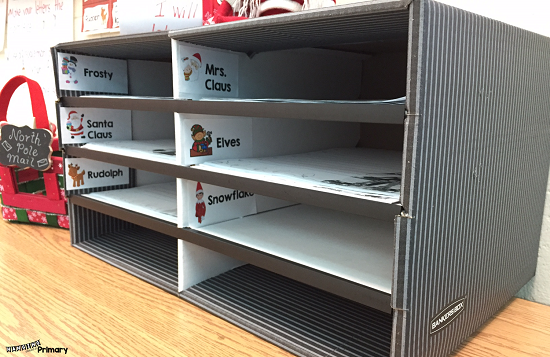 When the kids return to school the next day and see their letters are gone, they are super excited to know that they were delivered to the North Pole. Do I need to respond to ALL.THE.LETTERS? Nope, I don't have time to respond to all the letters that get "mailed" and believe me, there are many. I do take time to answer several every week, and those letters magically appear on the writer's desks. I am sure you can imagine what happens next. You guessed it, more interest in the Writing Center and more writing happening. How do I know this is going to make a difference for my reluctant writers? I know it does. Every year I have students who either don't write more than a few words or have writing that lacks conventions. Once I introduce our Santa letters and the Writing Center I slowly see these reluctant students blossom. They WANT to write, and they WANT their writing to be understood, so they TRY to use conventions and include the details that have been lacking. Often all these students need is the confidence and desire to write. Every year it happens for a few of my students, and I feel strongly that it will work for your students too. If you are interested in trying this resource, you can find it by clicking on the cover image below. 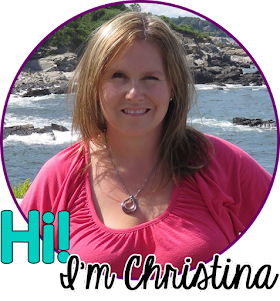 If you want to keep the letter writing going after the holidays be sure to check out my Thank You letters resource. Students plan and write a thank you letter to someone for a gift they received.